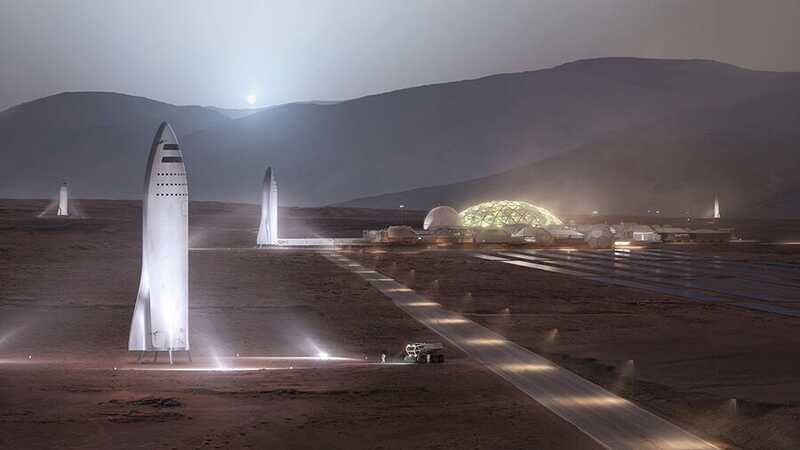 SpaceXAn illustration of SpaceX’s Big Falcon Rocket helping to colonize Mars. NASA and SpaceX want to send people to Mars. Solving the threats posed by radiation will be essential to visiting Mars, let alone colonizing the planet. Here’s how a trip to Mars compares to dental X-rays, radiation-worker exposure limits, and more. But the cosmos teems with invisible, high-energy radiation – particles travelling near light-speed that can pummel human travellers and the surfaces of worlds like tiny bullets. The graphic below – created using data provided by NASA, the EPA, FDA, NRC, scientific journals, and other sources – compares various exposure levels in scenarios both familiar and far-flung. Hover over a category box to see how it compares. Musk has “aspirational” hopes to launch a round-trip mission to the red planet with humans in 2024, but the trip could total a year, and astronauts may spend about 500 days on Mars’ surface. The whole journey would expose astronauts to about 1,000 millisieverts – depending on how many solar storms belch high-energy particles toward Mars, and whether the first entity to reach the planet actually lands on it. This means the first Martian explorers could get roughly eight times the amount of radiation per year of a radiation worker’s annual exposure limit. In total, the space travellers would get about one-third of the way toward hitting a NASA astronaut’s maximum lifetime exposure limit (2,500-3,250 mSv). 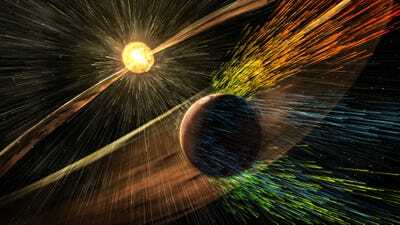 NASA Scientific Visualisation Studio/MAVEN Science TeamA simulation of Mars being blasted by solar particles. 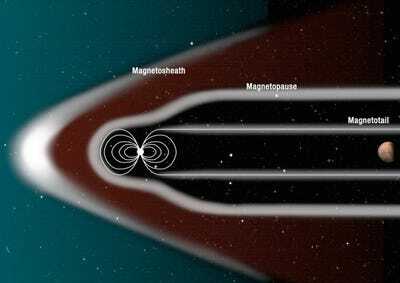 Earth’s magnetic field and atmosphere protect us by deflecting and absorbing most of this energy. “The background radiation rates on the ground are 100 times to 1,000 times smaller than they would be above the atmosphere in free space,” Edward Semones, a radiation health officer at NASA’s Johnson Space Center, previously told Business Insider. Animal-based experiments also suggest radiation could damage the nervous system, including the brain, which might impair astronauts’ focus and memory. NASA’s potential use of AstroRad vests and Musk’s solar-storm shelter would just be a starting point for Mars adventurers and colonists. One solution is for Mars colonization missions to use Phobos, the planet’s largest moon, as a pit stop since it likely harbours water ice just below its ruddy surface. Probes drilled into Phobos could heat and melt the ice, pump the water into elastic cells that surround a spacecraft, and shield a crew from radiation. More radical solutions for radiation have also been proposed. Christopher Mason, a geneticist and biomedical researcher, suggests creating transgenic humans as part of a 10-phase, “500-year plan” to colonize space. His concept is to use a technology like CRISPR to edit a space flier’s genome to constantly repair, as Mason put it, “do not disturb” regions that lead to cancers and other problems. James L. Green at al./USRAA concept for an artificial magnetic shield that would prevent a terraformed Martian atmosphere from being blown into space by solar storms of high-energy particles. Ultimately, colonists may try to terraform Mars – a deliberate and unprecedented act of climate change. Frozen carbon dioxide at the Martian poles could be turned into greenhouse gases in order to create a radiation-absorbing atmosphere that would insulate the surface. Plants could then convert the thin air into oxygen and, over hundreds of years, temperatures may warm enough to melt hidden water and make it again flow on Mars’ surface. One day, that could even permit spacesuit-free excursions. Jim Green, the former head of NASA’s planetary science division, has proposed building an artificial magnetic shield for Mars to protect a hypothetical nascent atmosphere from the sun’s proton radiation, which might otherwise blow the air into space.